Bedtime is without a doubt my favourite time of the day - fact. I've simply never been nor wished to be a morning person, much preferring to spend extra time in the comfort of my bed... something I'm sure a lot of people can relate to especially at this time of year! 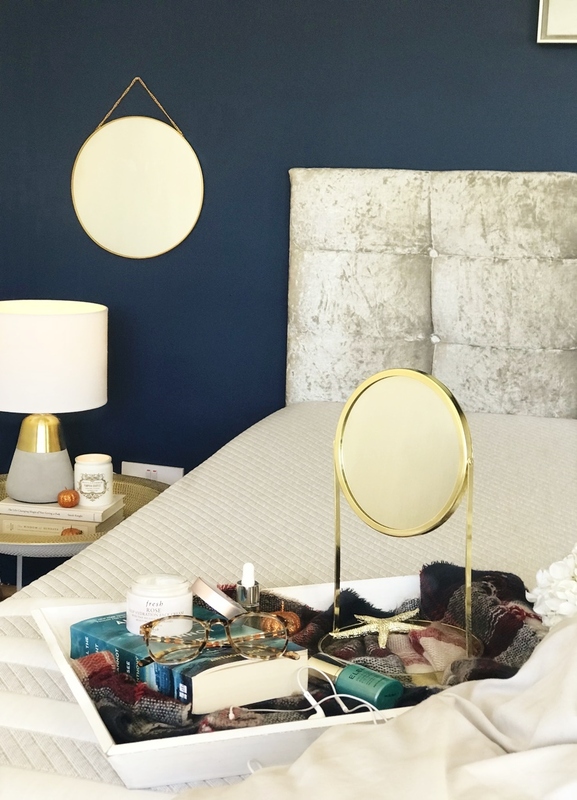 For me, a bedtime routine is very much self-care practice so having everything just right, from my skincare routine to my bedroom decor and bed is key. Comfort is also beyond important to me, which is probably why I treated myself to a super king size bed at the start of the year and recently upgraded my mattress to a premium foam mattress thanks to Leesa. 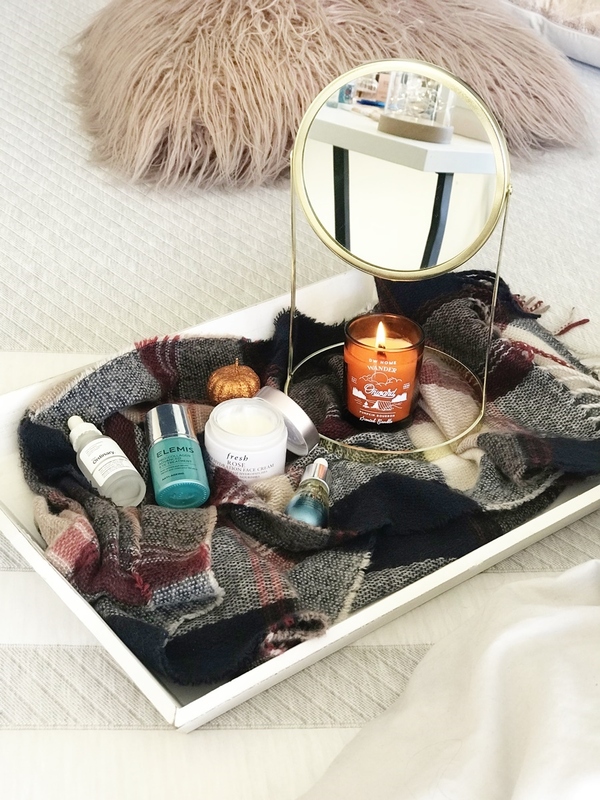 So today I wanted to talk through my autumnal bedtime routine, sharing only my most relaxing and comforting products and practices. I hope you enjoy this skincare/lifestyle post from me. When it comes to my evening skincare routine I like to remove my makeup as soon as possible. That leaves my main skincare routine that I do sitting on my bed just before I go to sleep, which works well as I find it a relaxing process. Gathering my skincare products and laying them out in front of me I first start with The Ordinary Niacinamide 10% + Zinc 1% as it's an amazing serum to regulate sebum production and simply keep blemishes at bay. While that is drying down I lightly massage a cooling eye treatment to my under eye area until it's completely soaked in. To round off my evening skincare routine I mix two drops of Elemis Pro-Collagen Marine Oil with Fresh Rose Deep Hydration Face Cream, both products are light and soak in wonderfully when combined, leaving zero residue on my oily skin type. I enjoy sweeping these products over my face breathing in the essential oils and knowing my skin will be thoroughly hydrated and nourished as I sleep. Post skincare I like to get into bed, spritzing a lavender based pillow spray over my pillow and duvet to encourage deeper breathing. 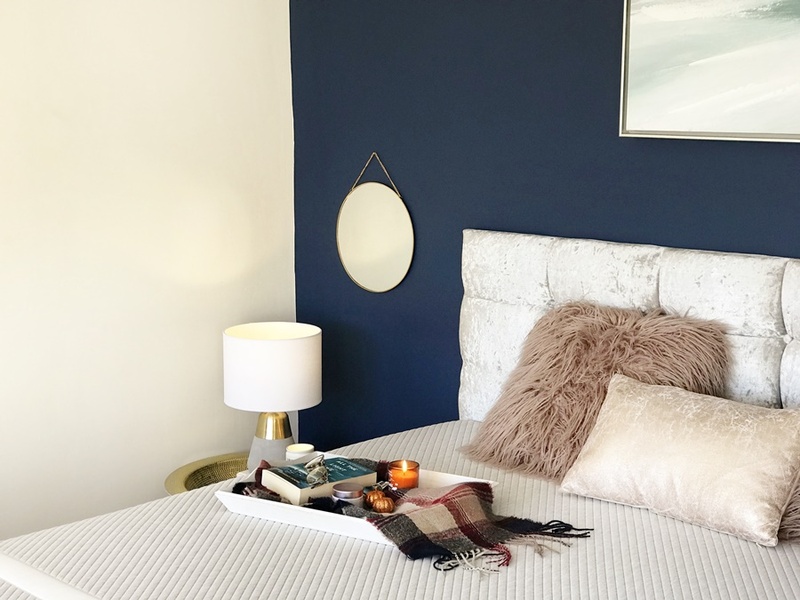 My bed is certainly my safe space, somewhere I know I can go to seek comfort both physically and mentally when I need some downtime and of course to get a restful and restorative night's sleep. 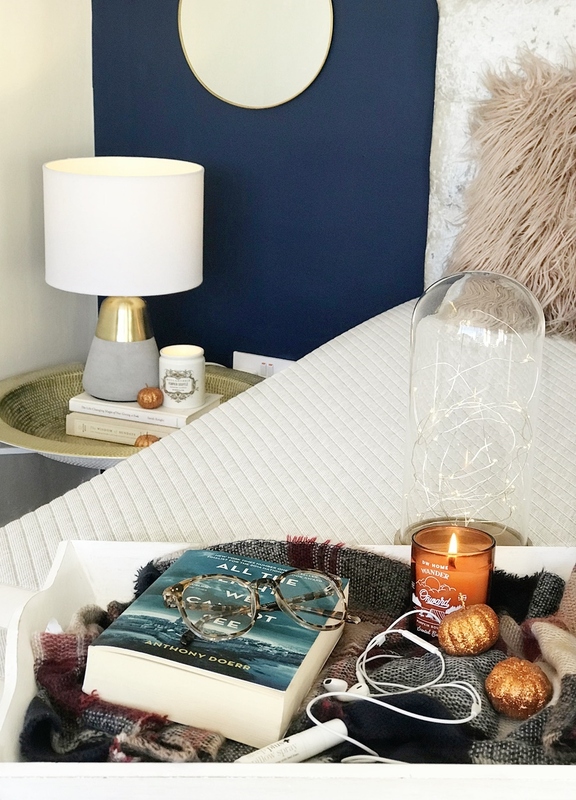 So I was excited to receive a Leesa mattress to help me achieve that, especially as my old sprung mattress would often make noises due to the springs during the night and feel generally unsupportive. Leesa, in fact, want their customers to buy with confidence so if you are not sleeping better on a Leesa mattress within 100 nights, they will donate the mattress to a charitable organisation and provide a full refund should you request one. Leesa is also committed to doing their part, donating one mattress to charitable causes, for every ten sold! 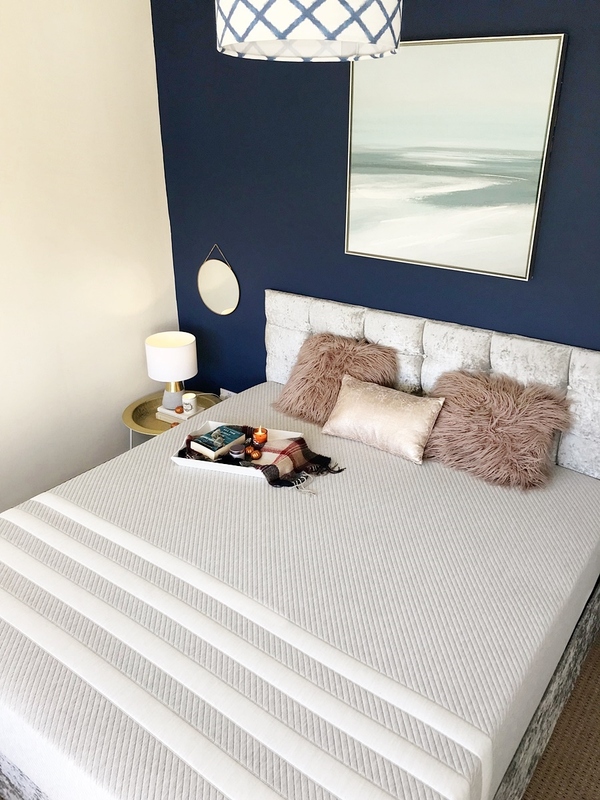 As the Leesa has one goal in mind: to help people get a better night's sleep, I was interested to see exactly how comfortable the three foam layers (5cm Avena Foam, 5cm Memory Foam and 15cm Support Foam) of this completely foam mattress would be. On taking it out of its box (yes, it's delivered in a box!) and unrolling it allowing it to fully expand first, I instantly noticed 1. How soft the cover felt and 2. The fact even just the pressure I placed on it with my hands felt supported and cradled. 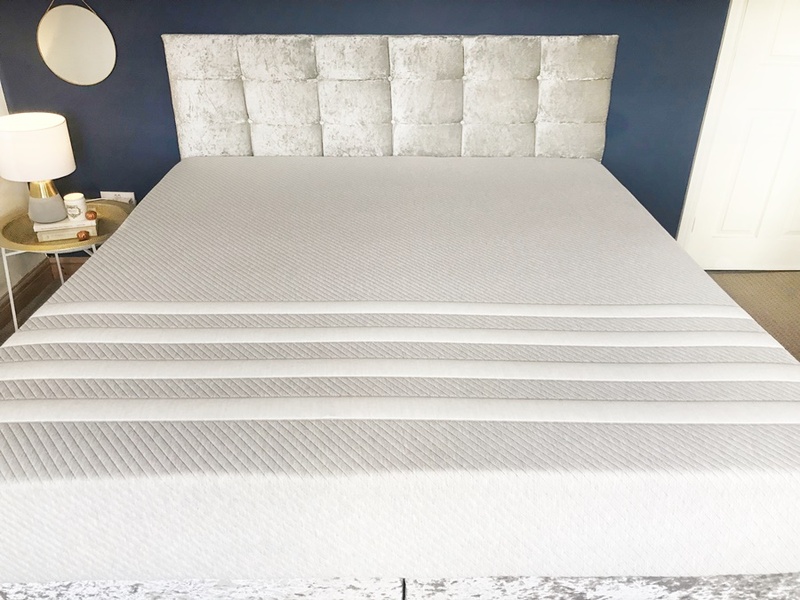 Going from a sprung mattress with zero foam to a Leesa foam mattress did take a few nights adjustment, however, I could immediately sense it was providing optimum support especially to my back which I often hold tension in. I also couldn't get over how much of a difference sleeping with the soft mattress cover underneath my fitted sheet made; so soft and comfortable! Having slept on a memory foam mattress before I was slightly concerned about getting too hot in the middle of the night, thus affecting my sleeping. But I had nothing to worry about as from my first night's sleep on the Leesa mattress I found the top Avena foam layer to offer good airflow, not heating up with my own body heat at all. I also found moving around in bed easy to do and even sitting on the edge of my bed gave support and didn't simply sink down with my body weight. With such a premium mattress along with a relaxing lavender pillow spray and a lightweight but warm feather duvet I now feel I have all elements of a perfect night's sleep, something I truly appreciate. If you also want to experience the joy of a Leesa mattress find a special £100 off code at the bottom of this post! Once comfortable in bed, something that's not hard to do anymore - whoop, I normally spend 30 minutes to an hour winding down before sleep. I try my best to stay away from social media and turn on the 'Night Shift' mode on my phone if I plan to watch something, as it gives off a warmer, less blue light to help the brain slow down and not be as affected from the light. My current favourite TV show that I'm working my way through is Gilmore Girls which is both fitting for this time of year and feels light and cosy, always putting me in a relaxed mood. While I love to binge-watch the series at the weekend in bed I allow myself one episode a night before sleep and it really is my favourite thing to do right now! 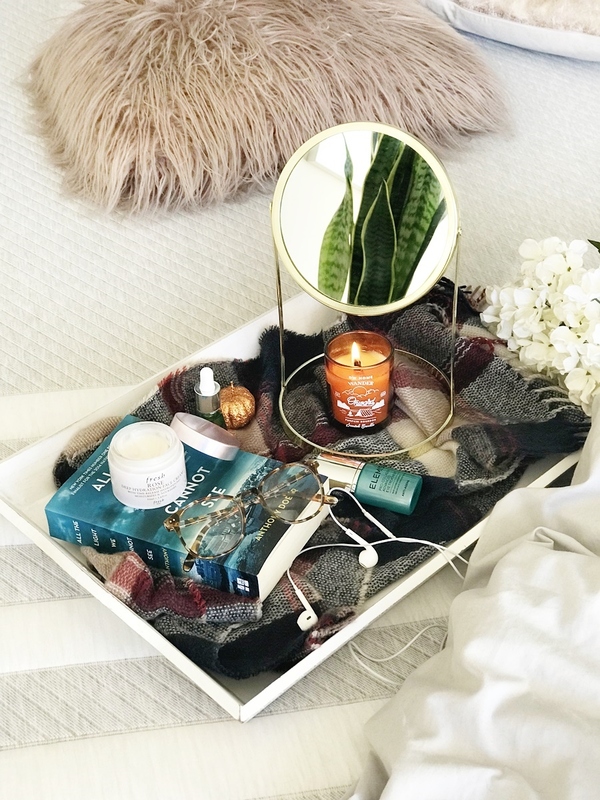 Another way I love to relax especially if I want to really wind down and relax or if I'm having an early night is to read with a cosy autumnal scented candle burning next to me. I enjoy using the Kindle app on my phone during the day but prefer a physical copy of a book when reading in bed at night. All The Light We Cannot See is my current in-bed read which although is based around WWII has the most authentic and well developed main character I've come across in a long time. A book really to get lost into before sleep! Receive £100 of any Leesa mattress of your choice with code 'MAKEUP SAVVY' here! Disclaimer - This post was created in collaboration with Leesa, who provided a Leesa Mattress for review, but all views and opinions expressed are my own. Some links in this post are affiliate links. This means I may receive a small percentage of a sale if you click these links and purchase a product.